This two day course is the perfect introduction to sailing, or a good refresher if your docksiders are a bit dusty. Upon completion you should be comfortable skippering a small boat (up to 30 feet) in light to moderate conditions, in familiar protected waters, during daylight hours. Core sailing concepts are made clear, as well as rules of the road, boat handling and sailing skills, knots, safety standards and more. 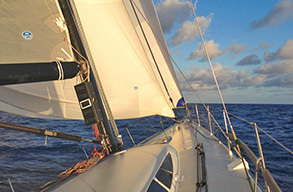 This class is taught on a monohull (as required). Prerequisites: none, this is for newbies!